Haha, great shot! 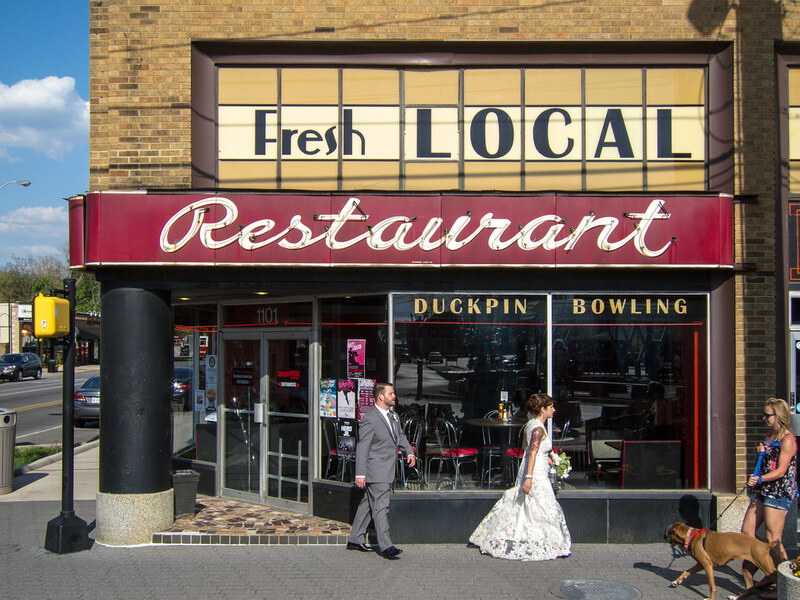 But so many questions…..
1) What on earth is Duckpin Bowling? And do animal welfare know about this? 2) Is Fresh Local actually the name of the restaurant, or just what is considered it’s positive attributes? Either way, it’s deliciously meaningless! I mean every where’s local to somewhere, and if fresh is the best they can say…..
4) Has the dog just done a double take at those purple shoes? 5) Did someone famous once say “a good photograph should leave us with more questions than answers”? Or did I just make that up? So here’s the thing. I shot this facade ten times trying to get it framed right. I paid no attention to the people on the street. Frankly, I wanted a people-less shot, but that was impossible so I just shot regardless of the people in the frame. It wasn’t until I got home and looked at the pics that I realized that the best-framed shot had this almost impossibly perfect scene, of the bride walking away, looking slightly steamed, from a fellow I presume has to be the groom. The woman with the dog was just an added bonus. 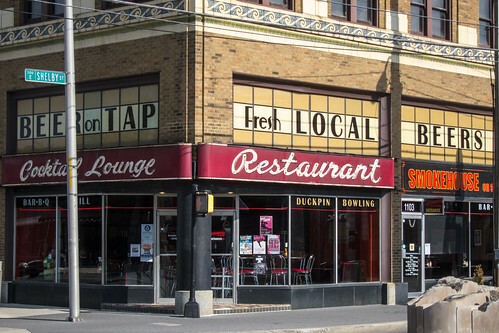 Duckpin bowling is a kind of bowling where you use these smaller balls that have no finger holes. I’ve watched it done, at this very venue. It looks like fun. And good eye on the purple shoes. Thanks for providing a narrative to this scene! Oh: Here’s another shot of this restaurant that shows more of the context. The restaurant is “Smokehouse on Shelby” — the Fresh Local thing is just advertising the local beers on tap.